Dixie Gator Gal: New Fall Scarf! 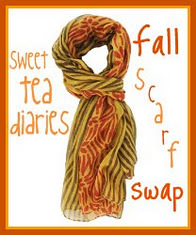 A few weeks ago, I signed up to participate in a Scarf Swap, hosted by the lovely Angela at Sweet Tea Diaries. I've been reading her blog for years, and just love the stories of this southern belle living on the west coast. I also love that we are sorority sisters (from different schools), too! I was paired up with Mrs. Jansson from The Jansson Family. She sent me the most perfect scarf, and extra goodies as well!! I just love it, thank you so much!! I'll be donning an ivory coat this winter, something new for me. Most of my scarves are bright and solid, so I am thrilled with this fun pattern and earth tones. I love the Burt's Bees-how did she know I was addicted?!? I have the fire roaring and am ordering my Holiday Party Invites and Christmas Cards, today. My friend Christy is over and treated me to my first "red cup" of the season, YAY for half calf Peppermint Mocha's! I returned the favor by treating her to lunch. She had Josh's homemade chili and I had my homemade chicken noodle with salads-yuum. Nothing is more fun than spending the afternoon with friends by the fire! Hey girl! Wow, I loooooooove your scarf! It's so unique and will look so pretty with your ivory coat! I also love the bracelets, how nice of Mrs. Jansson to include those! The scarf she sent you is so pretty! I'm a scarf-a-holic so reading these swap posts is not very good for my obsession. This will look great with an ivory coat. That was nice she included some nice little extras too. I need some Starbucks, especially since the red cups are back! P.S. Your fireplace looks so cozy! Yay! I'm so happy that you like the scarf! I had a blast shopping for it. Your fire looks so cozy and inviting! I hope you have an amazing weekend.